The Global Livability Index 2018 has named Vienna as the most livable city of 2018 and there are plenty of reasons that it deserves the title. It has some pleasant sights and several large green spaces, clean and wide boulevards, an efficient transportation system, and much more. Besides being a great place to live in, Vienna is also a wonderful destination for tourists as well. It is a city that you will fall in love with and would want to visit time and again. And if these reasons are not enough to make you excited about visiting the city, let us give you some more. Vienna is a paradise for history buffs as it is home to several world famous monuments. The city is home to the House of Habsburg, which is amongst the world’s largest palace complexes. It comprises several wings that are designed a variety of architectural styles from the 13th to the 20th century. The palace stands proudly, with a glorious history of being the seat of control for seven centuries. You can explore the palace grounds on a Fiaker, a horse-drawn carriage with its drivers doubling up as your guides. Another reason that you must visit Vienna is the Austrian National Library or the Österreichische Nationalbibliothek, which is among the most beautiful libraries in the world. The magnificent cupola is decorated with beautiful frescos. Besides being revered for its lavish Baroque style architecture, the library also has a wonderful collection of books, historical manuscripts, maps and globes. As soon as you land and make way from Vienna airport to any hotel, Sachertorte will be one name on your mind if you have done some research before your holiday. Referred to as the world’s most famous cake, this is a classic recipe that originated in 1832 and continues to win hearts even today. The delicious chocolate cake is layered with apricot jam and is served with unsweetened whipped cream. The famous Sacher Hotel is the place to taste this handmade, original recipe. Besides history and food, Vienna is acclaimed for its music as well. The city has been home to some great musicians, with the likes of Mozart, Haydn, Vivaldi, Salieri and Schubert. Music still runs in its veins, with places like the Museum of the Johann Strauss Dynasty, Arnold Schönberg Center and the Mozarthaus keeping its musical legacy alive. It also hosts several musical concerts all through the year. If you are visiting the city with family, the Prater amusement park promises a great experience full of fun and excitement. Also known as the Wurstelprater, this wonderful park is located on former imperial hunting grounds. The biggest attraction that it offers is the Wiener Riesenrad, a Ferris wheel that offers spectacular views of the Danube and the entire city. 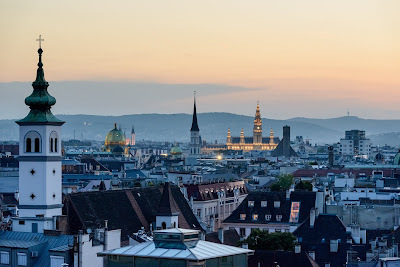 Some other attractions that you should not miss while you are in Vienna are the Schönbrunn Palace, the Vienna State Opera and the Naturhistorisches Museum and the Kunsthistorisches Museum. The city is a true gem and the best time to visit it is during the Christmas festivities, when it replicates the magical vibes of the season.